When travelling overseas, there are often two competing temptations. One is to relax, order a drink and sit down, revelling in the fact that, unlike in the working week, there are no deadlines, no pressures, no to-do list that simply has to be completed. Against that, of course, people will create their own checklist of things to do and see. Rather than hitting the cafes, the temptation is to be constantly on your feet, dashing around the town to see the sights. 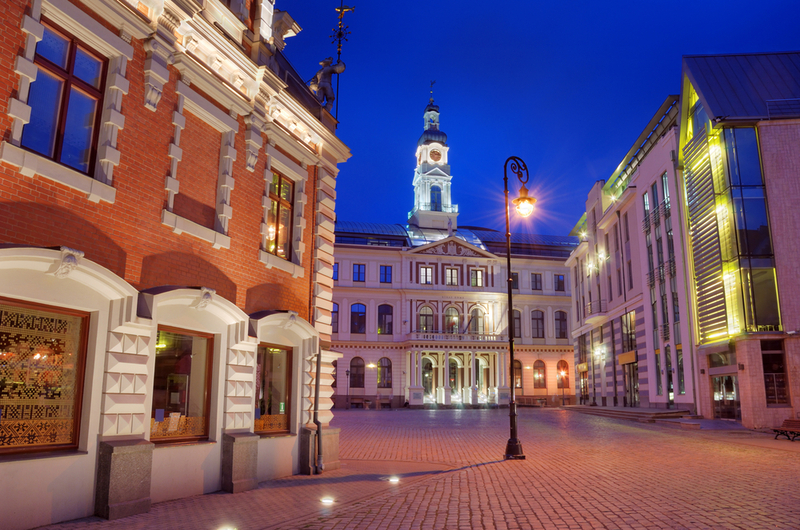 The good news is that when it comes to Riga’s Town Hall Square, you can do both. Riga Town Hall Square offers a curious but historic mixture. Much of it is medieval, the sort of architectural gem that westerners were deprived of the chance to enjoy during the cold war. The fine buildings on show include St Ekaba’s Cathedral and the ornate 13th century Blackheads House, which was damaged in World War II and not restored until 1999. During the war it was the Russians, not the Germans, who invaded and annexed the Baltic states and the square suffered massive damage. This included to the Town Hall itself, which was redeveloped with a prominent Baroque tower. However, the rebuilding work was not just about restoration; also included was couple of intimidating-looking Soviet-era buildings. These are not pretty, but the ugliness of their imposition is perhaps symbolic of that era in Latvian history. However, various times in Riga’s history have brought new developments, such as the statue of St Roland, which was mounted in 1897. It, too, had to be restored after its wartime destruction. Visitors to the square today can certainly experience it at their leisure. There are loads of cafes and restaurants to enjoy, meaning it is easy to spend a whole day in the square. Truly there is no need to rush, for so much of what is best about Riga is here. Lunch and a frothy coffee, the historic buildings, plus indoor attractions like the Latvian Occupation Museum, the Sun Museum and the Riga Art Space, a modern gallery. Quite simply, Town Hall Square is where it is at.